Note: The videos shown here may be different products that are not related to this product detail page. Fantastic red and white traditional nutcracker soldier on rocking horse Christmas decoration. With moving "nutcracking" mouth this is for decorative purposes only. Fun, eyecatching retro vintage CHRISTMAS ornament. Also a fantastic visual prop for the retelling of the NUTCRACKER STORY - children will love to see Clara's NUTCRACKER DOLL, her gift from Herr Drosselmeyer. 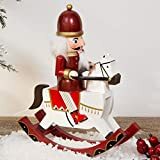 Burgundy, red and white wooden Christmas Nutcracker / Rocking horse decoration. I want to receive a email to when the price is bellow £ .